Couples can win anywhere from $250 to $2,500 off a destination wedding or a 7-night stay for two. DWTG had another record breaking year with bookings increasing over 30% from 2013 to 2014. Destination Weddings Travel Group (DWTG), the world’s leading destination wedding and romantic travel planning company, is celebrating the holiday season and a year of extremely strong growth with an exclusive gift for couples who join before Christmas Eve. The promotion, a play on Secret Santa, offers customers with anywhere from $250 to $2,500 off their wedding, with the surprise amount unveiled on Christmas Day. Partnering with leading hotelier AMResorts, this offer is exclusive to DWTG couples who book their wedding through the premier travel site at any AMResorts property located throughout the Caribbean, including Zoetry Wellness & Spa Resorts, Secrets Resorts & Spas, Breathless Resorts & Spas, Dreams Resorts & Spas, Now Resorts & Spas and Sunscape Resorts & Spas. 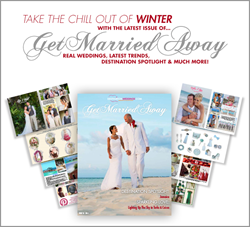 In addition to the holiday promotion comes the release of DWTG’s winter digital magazine, Get Married Away. Filled with unique wedding planning inspiration, the interactive magazine offers exclusive content and industry trends in addition to the chance for couples to win an all-inclusive 7-night stay for two at a luxurious resort in Cancun, Mexico. Get Married Away is now available exclusively on DestinationWeddings.com. The Secret Santa holiday promotion can be found exclusively on DestinationWeddings.com now. DestinationWeddings.com, part of the Destination Weddings Travel Group, has worked with over 15,000 couples and 500,000 guests. In 2012, DestinationWeddings.com was ranked by Inc. Magazine as one of the 500/5000 fastest-growing private companies in the country for the fifth consecutive year. Combining the personal service and expertise of more than 200 certified specialists with resort partnerships in over 42 countries, DestinationWeddings.com allows for a premier, one-stop shopping experience for customers seeking an exceptional destination wedding experience. For more information, visit http://www.DestinationWeddings.com.